Mostly bare root trees – Broadview and Buccaneer are supplied in 5-7 litre pots. 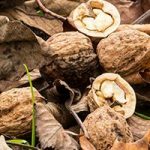 Walnuts usually require cross pollination – plant at least one variety each of groups A and B unless partly self-fertile (ie A+B). All the varieties below are mid-late leafing, minimising possible late frost damage problems; and are resistant to leaf & fruit diseases. They start cropping within 2-5 years.